First order of business is the motor. On my orginal version I suspended the motor from a hinge to let the weight of the motor tension the belt, but found that the hinge wasn't strong enough to keep the motor aligned properly. So this time I went low tech. 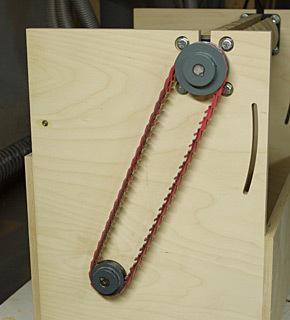 Bolt the motor to a piece of ply, with counterbored holes so the heads don't stick out. 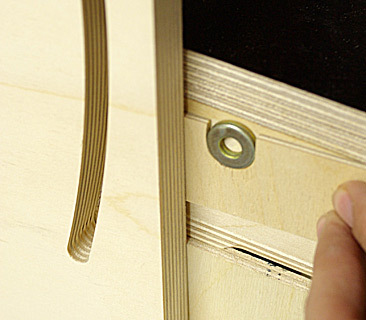 The motor plate is aligned to the edge of the board and the board is aligned to the side of the cabinet. The belt is going to stretch in use so add in some shims under the plywood base. Once the pulleys and belt are installed just screw it to the bottom of the cabinet. It's a little tough to reach the one in the corner, but I have a long exension for my driver. 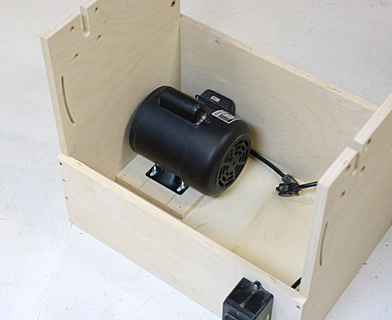 The motor should be 1750 rpms, and for the 18" version I would recommend at least 1 hp, though I am reusing the 3/4 hp motor I originally had and have done up to 18" width of cherry and sweet gum with it. For the 9" version 1/4 to 1/2 hp should be fine. 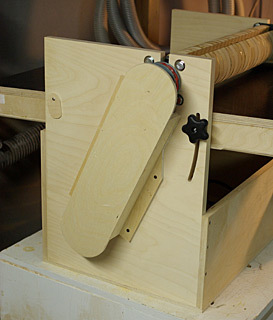 Pay attention to the motor direction, the drum must rotate against the feeding of the stock. Induction motors can usually be rewired to reverse them, which I had done in this case. Next comes the drum assembly. It's helpful to make a spacer bar to make sure the sides are the right distance apart, otherwise the table can bind as it travels up and down. Snug up the bolts and then center the shaft at both sides in the holes before tightening. Finally tighten the set screws on the bearings, being sure one set screw goes into the keyway. Then the pulleys can be put on so you can determine the length of the belt. My advice is make it one link shorter than you think it ought to be and it will probably be good. If you didn't make the hole for the motor shaft large enough, like me, you may have to get the belt on one pulley with it off the shaft. Tension the belt by sliding the motor back and screw it down. Next the table is installed, which is a bit fun. Get one dowel pin started, then the other side in before trying to drive the first one all the way in. Now we need to get the table locks installed. Two washers are glued together to act as a spacer on each side. To get the spacer in place make a hole in some thin stock and cut it so it's half a hole. This allows you to slide it in place without cursing over it for 15 minutes. Also note I added some cover plates over the pivots, just in case.